13.07.2017 In an independent selection process, Rittal has secured a place among Germanys hundred most innovative companies. The world’s leading provider of industrial enclosures, power distribution, climate control and IT infrastructure has been honoured by leading innovation researchers for developing ground-breaking technologies. 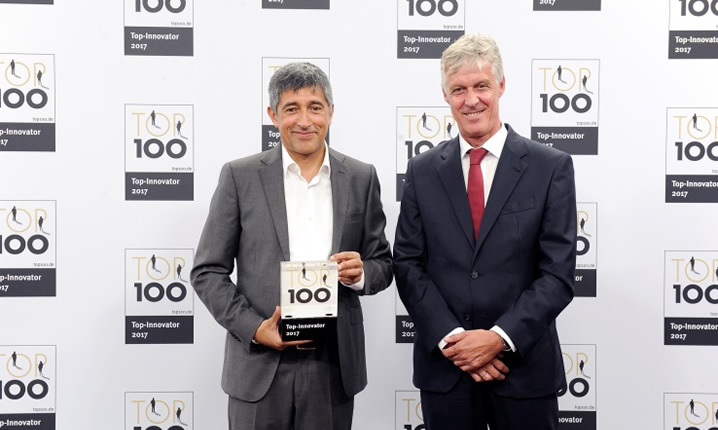 German TV host Ranga Yogeshwar acknowledged the innovative power of the family business and awarded it the prestigious “Top 100” medal. Rittal has now been honoured for innovation in enclosure manufacturing. The Top 100 medal went to the family business from the Central Hesse region, now recognised as one of Germany’s 100 most innovative companies. In a multi-stage application process, TOP 100, together with Nikolaus Franke, Director of the Institute for Entrepreneurship and Innovation at the Vienna University of Economics and Business, determined the most innovative companies among German SMEs. Remarkably, Rittal achieved its entire turnover with newly marketed innovations, which it had launched on the market before the competition. This was the jury’s reason for presenting the award to the global player. Rittal products are used in over 90 percent of all industries worldwide and it is one of Germany’s 26 most innovative leading companies on the global market. In the one-year auditing process, Rittal was a winner from the roughly 400 applicants, impressing with its well organised innovation processes and above-average innovation successes: “We have already achieved several quantum leaps in the trade with our products and so managed to surprise the industry,” said Dr Thomas Steffen, Managing Director Research and Development at Rittal. For both management and employees, it is clear that development and progress never cease. The best proof of this are the TS 8 and Blue e+ innovations from the world’s leading enclosure and system provider, which have set new standards in their respective markets. The TS 8 large enclosure is the best-selling enclosure in the world, with over ten million sold. It is used in mechanical and plant engineering, as well as the automotive industry, IT and the telecommunications industry and food and beverage production. It is also found in football stadiums and universities, in the desert or on Antarctic icebreakers. The Blue e+ generation of cooling units has been redefining standards in the field of energy-efficient manufacturing since 2015. Rittal’s developers have used hybrid technology to equip these clever cooling units for enclosures that protect sensitive controls from overheating. The result was seventy-five percent lower energy consumption, energy costs and carbon dioxide emissions on average. This all made its impression on the Top 100 jury. For the past 24 years, compamedia has been awarding the Top 100 medal to medium-sized companies for special innovative power and above-average innovation success. Its partners include the German “Manager” magazine and the Fraunhofer-Gesellschaft. 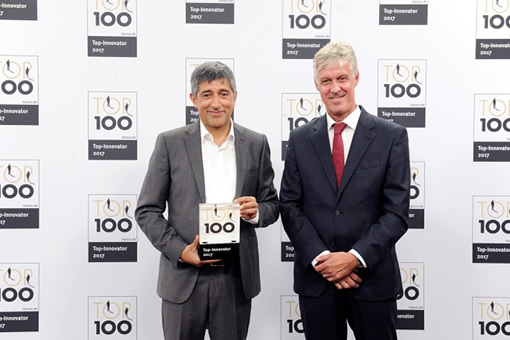 Image: Ranga Yogeshwar, TV host and mentor of the Top 100 competition handed the award to Dr Thomas Steffen: Rittal did well in the competition with its well organised innovation processes and above-average innovation successes.